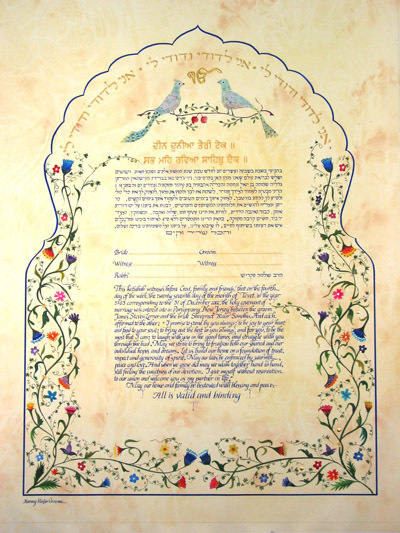 The blue colour Interfaith text in Hebrew and English is surrounded by colourful flowers.This is on a soft "parchment" background. The Indian-style arch in a Gate motif, symbolizing entrance to a new life together, is followed by verses from the "Song of Songs": " Ani LeDodi VeDodi Li". A delicately executed pair of Peacocks resting on a branch of a Pomegranate tree symbolizes Fertility/Abundance. Detail: Indian script in 23K Gold Leaf above the peacocks and in Gouache below.